Nicolina’s qualifications in psychology include a Bachelor of Arts with Honours in Psychology followed by a Masters in Psychology both from the University of Sydney. She is registered Medicare provider as a Clinical Psychologist and also registered with WorkCover. Nicolina has extensive experience working as a Psychologist including working for several years for the Department of Health at Fairfield Community Health Centre where she worked across the age range seeing children, adolescents and adults with a wide variety of psychological problems and diverse cultural backgrounds. As well as working with individual clients she also ran groups including parenting groups for new parents and for parents of adolescents, stress management and support groups for psychiatric patients. This was very valuable experience for a young Psychologist who was also studying part time for her Masters’ degree. 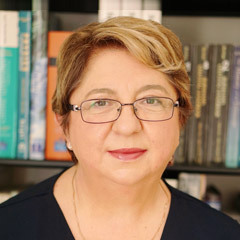 Following completion of her Masters’ degree which qualified her as a Clinical Psychologist, she transferred to Westmead Hospital where she worked in the acute care Burns Unit, Adolescent and Paediatrics wards as well as working as part of a large Psychology Department providing services as needed to the other acute care medical, mental health wards and outpatient departments. She left Westmead hospital as a Senior Clinical Psychologist after the birth of her first child and has worked in private practice since this time. She joined Riverlands Therapy Services in 1998. Nicolina uses evidence based interventions specific to each client’s needs including Cognitive Behaviour Therapy, Acceptance and Commitment Therapy, Mindfulness, EMDR, Clinical Hypnosis, Motivational Interviewing, Solution Focused Therapy, Psycho- education, Stress Management. Nicolina is a member of the Australian Psychological Society and of the College of Clinical Psychologists. Nicolina understands the courage it often takes to recognise that a problem exists and to ask for help. She gets great professional satisfaction in seeing clients overcome their difficulties and move on to living the best lives they can. Nicolina is available for appointments at Riverlands at Penrith on Tuesdays.